Howard Reed finds that the impact of the coalition’s tax and benefit measures could end being as bad for inequality as the Thatcher government’s record. Turning the tide needs to be at the heart of Labour’s strategy for government. The impact of the total package of tax and benefit reforms between 2010 and 2015 is to increase the Gini by 0.018 points – more than half as much again as the total increase in the Gini which arose from tax and benefit reforms over the period 1978 to 2008. That gives anyone concerned about poverty very real reason to worry. I strongly recommend the rest of the article. And if you want to protest about this, better do it quickly. It looks as though any kind of gathering or protest is being outlawed. Cameron’s obviously expecting to get rumbled by the broader population at some point and in the manner of despots everywhere is preparing to outlaw all and any dissent. This is chilling especially when one considers also the reduction in legal rights Grayling’s bringing about at the MOJ. I suspect he and his cronies will learn eventually that you can’t put that particular genie back in the bottle but to me these actions serve to underline my earlier assertions here and elsewhere that we’ll soon be seeing civil disturbance on levels not seen since Cromwellian times. Looks like the Coalition agree with me and are taking steps to nip all protest in the bud. Have a look at Spain, despite its troubled economy, it can magic up a yoy increase of 1,780 percent on riot control gear. I’m sure the troika raised no objections to this gdp enhancing move. What I would love to see is more comparison in reports of these sorts of statistics with other countries. Of course one can look up Gini coefficients, for example, online, but it’s often difficult to tell if they are directly comparable because of methodological differences. The law will outlaw any gathering at all, even football matches, if the police think any anti-social behaviour may happen. I see labour, by their lack of any protest, are in favour of said law. Looks like we are heading for a two-party dictatorship. Which brings to mind something else I was suggesting a while back; that the Coalition might broaden to include the two Eds and future elections might be dispensed with. It’s looking more likely now, isn’t it? Is this not a distortion of the facts to suit your preferences? Has not the actual Gini fallen between 2010/11 and 2011/12? 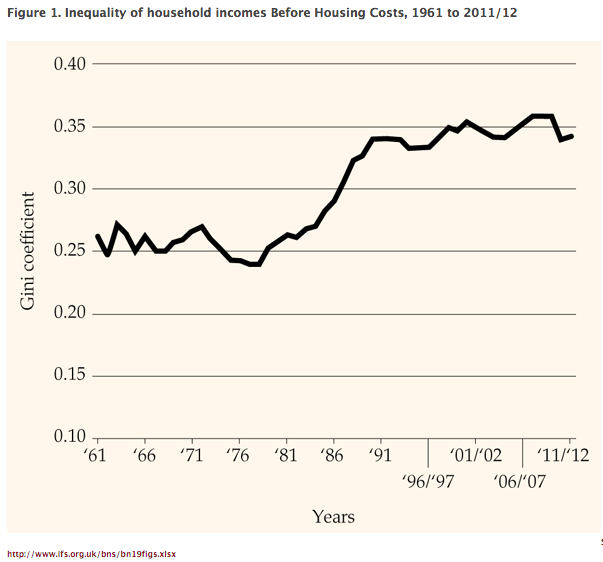 This is a fixed chart altered by removing housing costs to show an uptick in the Gini when in fact by the usual widely used method it fell…..
Are you sure your comment does not reflect your own bias?